The percentage of overweight children has more than doubled in the last 30 years. Overweight children are at high risk of becoming overweight adolescents and adults, placing them at risk of developing chronic diseases such as heart disease and diabetes later in life. Children become overweight for a variety of reasons. The most common causes are genetic factors, lack of physical activity, unhealthy eating patterns or a combination of these factors. Only in rare cases is being overweight caused by a medical condition such as an endocrine disorder. Although weight problems run in families, not all children with a family history of obesity will be overweight. Children whose parents, brothers or sisters are overweight may be at an increased risk of becoming overweight themselves, but this can be attributed to shared family behaviors such as eating and activity habits. A child's total diet and activity level play an important role in determining a child's weight. Today, many children spend a lot of time being inactive. 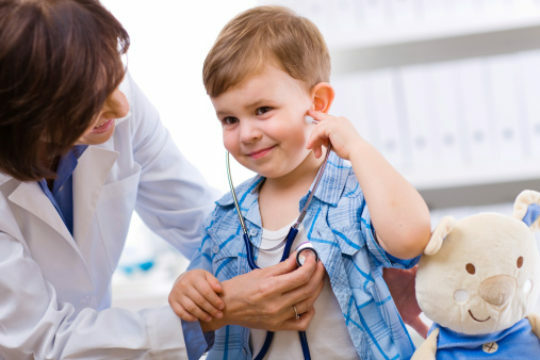 The best person to determine whether or not a child is overweight is the child’s doctor. If you think that your child is overweight, it is important to arrange an appointment with the child's doctor. In determining whether or not a child is overweight, the doctor will measure the child's weight and height to determine if his or her weight is within a healthy range. The doctor will also consider the child's age and growth patterns. Assessing obesity in children can be difficult, because children can grow in unpredictable spurts. If your child is overweight, it is very important you let him or her know you are supportive. Children's feelings about themselves often are based on their parents' feelings about them. It is also important to talk to your children about their weight, allowing them to share their concerns with you. Plan family activities that provide everyone with exercise, like walking, biking or swimming. Whatever approach parents choose to take, the purpose is not to make physical activity and healthy eating a chore, but to make the most of the opportunities you and your family have to be active.